How about adding a little modern touch to this holiday’s table setting? I am in love with all things gold, and I’m the girl that only owned silver jewelry and made my husband get my wedding ring in white gold (before it was everywhere). But tastes change and I’m digging metallic gold in home accessories and fashion. Pair gold with pretty pastels and you are totally on trend. 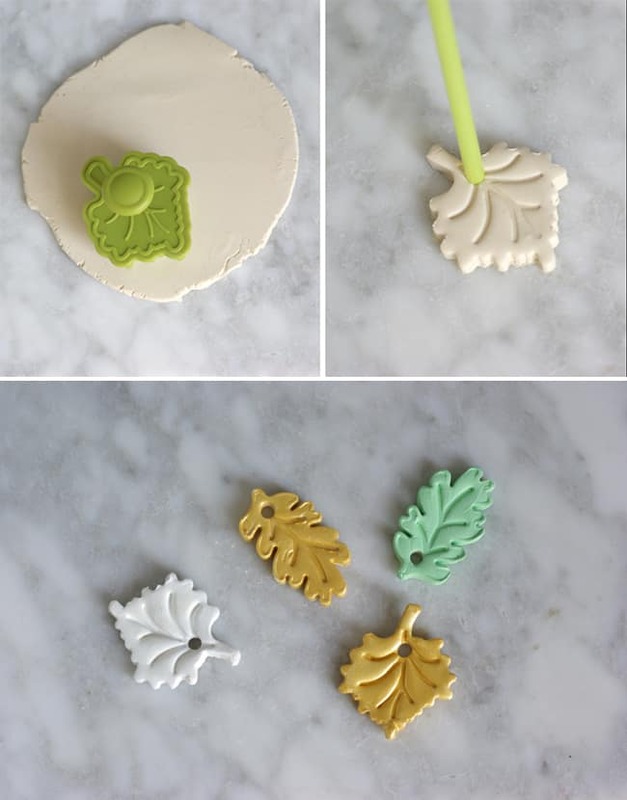 I made these sweet little leaf napkin rings to give my table a little custom touch. These are great to make with your kiddos as well. Start by rolling out the clay to about 1/4-inch thick. Then simply cut out your leaf shapes. I love these cutters because they also leave an imprint on the surface of the shape. Then using a straw, make a hole for the ribbon to be threaded through. Now for the toughest part of this little craft, you have to let them dry for 2-3 days. Waiting is the worst, don’t you think? When they are completely dry you can paint them. 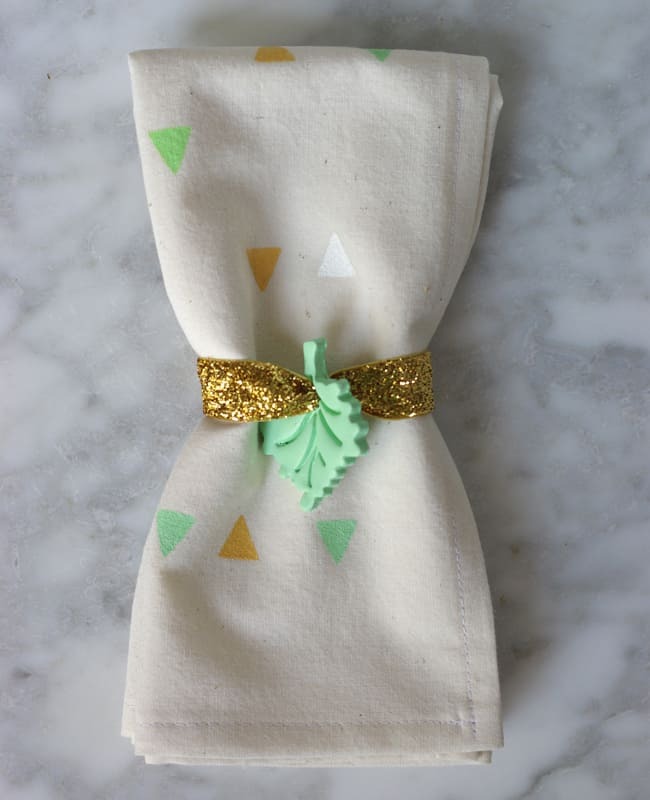 I chose a gold, white and mint combination to go with the mini triangle napkins I made. Each leaf will need two coats of paint. 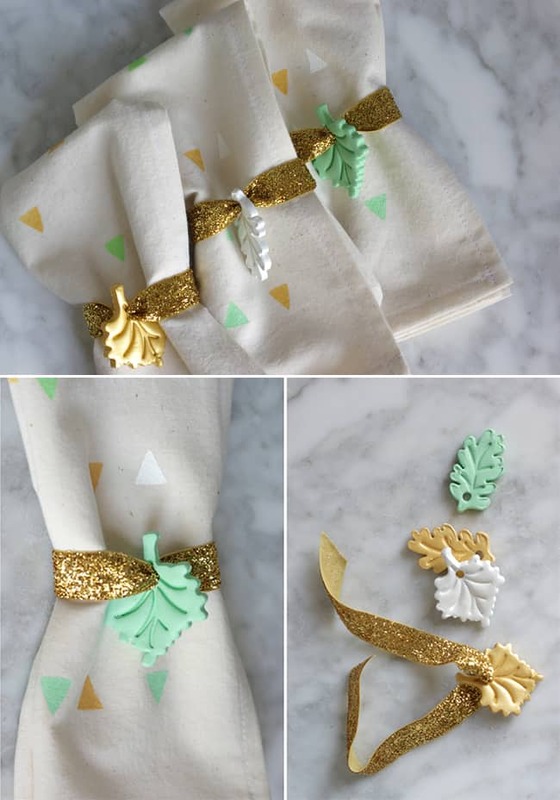 When the paint is completely dry, thread a 10-inch length of glittery gold ribbon through each leaf and tie them around the napkins. I’m looking forward to having this special treat on each of my guest’s plates. Beauty is in the details, right? These would make great Christmas tree ornaments as well. I like to see your shared design. it is so impressive and very informative for use because here http://desktopiconswindows10.com/ we are easy to increase our desktop icon setting knowledge in without paying any cost. Wow, those are really cute and simple! I love how you used a stamp/cookie cutter. It makes it a lot easier to make a tonne of ’em! Well now I need to add clay to my craft kit. These look wonderful! These are so cute! I love the imprint on the top as well, so fun!